This video is designed for the people that may be interested in collecting ancient Greek and Roman coins from Macedonia, either as a Kingdom, Region or Province. Explored in this article and video above is a selection of various cities and kings from Macedonia that I have in my collection available for sale in my eBay online coin shop. My goal is to cut years off the learning curve in collecting ancient coins by making informative videos, and when people learn about the wonder, I can help them get the coins they want, being a win win for everyone. Please share this article, thumb up the video when you watch it as it will help others find it, as the artificial intelligence of search engines picks those things up. Enjoy! Click here to see the coins mentioned in this video. Alexander I – King: 495-454 B.C. Horse pacing right; A on exergual line beneath. Crested helmet right in linear square within shallow incuse.King of Aigai, Alexander enlarge dhis kingdom after the retreat of the Persians in 479 B.C., and was the first of the Macedonian rulers to place his name on coinage. Alexander III the Great - King of Macedonia: 336-323 B.C. Struck under Antigonos II Gonatas: Macedonian King: 277-239 B.C. Silver Tetradrachm 27mm (16.80 grams) Pella mint, circa: 275-271 B.C. Head of Alexander the Great as Hercules right, wearing the lion-skin headdress. ΒΑΣΙΛΕΩΣ AΛEΞANΔΡOY, Zeus Aetophoros seated left, holding eagle and scepter; Macedonian helmetin field to left; OK monogram below throne. Silver Tetrobol 15mm (2.11 grams) Struck circa 480-470 B.C. Forepart of lioness right, seen from above; acanthus above. Bronze 15mm (3.51 grams) Struck circa 432-348 B.C. Perdikkas III – King: 365-359 B.C. Head of young Hercules right wearing lion-skin headdress. ΠΕΡΔΙΚ / KA above and below lion standing right, holding broken spear in his jaws. Bronze 20mm (8.18 grams) Struck 168-149 B.C. Reference: Sear 1390 var. ; SNG ANS 87 var. Laureate head of Apollo left. ΑΜ / ΦΙ above and below race-torch; all within linear square. Silver Diobol 13mm (0.92 grams) circa 475-450 B.C. Goose standing right looking back, lizard above, H behind. Alexander III, the Great: Macedonian Greek King: 336-323 B.C. AΛЄΞANΔPOV, Head of Alexander the Great right with loose, flowing hair. KOINON MAKЄΔONΩN NEΩ, Alexander the Great on his legendary horse, Bucephalus, galloping right with cape flowing behind him and holding spear. * Numismatic Note: Leaders like Julius Caesar and the Romans and the Greeks alike had immense respect for the great accomplishments of Alexander the Great. Macedonia, being the kingdom of Alexander the Great’s birth, this coin featuring his likeness heralds the Neocorate status of the area, along with the Olympic-style games that accompanied it. Highly-coveted type. Silver Tetrobol 16mm (2.36 grams) Struck circa 470-390 B.C. Forepart of bull kneeling left, head right, two laurel branches above. Bronze 18mm (4.50 grams) Struck 187-31 B.C. Head of Athena wearing Corinthian helmet. ΘEΣΣAΛO / NIKHΣ above and below horse prancing right. ΘEΣΣAΛONIKEΩN, Two Centaurs prancing, back to back, each holding branch. Bronze 17mm (3.47 grams) Struck circa 300 B.C. Eight-rayed star, representing the sun. OYPANIΔΩΝ ΠΟΛΕΩΣ, Aphrodite Urania seated facing on globe, holding sceptre. Silver Tetrobol 14mm (2.48 grams) Struck 158-149 B.C. Reference: Sear 1387 cf. ; B.M.C. 5., p.9,11 cf. Macedonian shield, at center of which MA / KE above and below club right. Macedonian helmet left, with cheek-pieces. Greek King: Philip V - King of Macedonia: 221-179 B.C. Bronze 18mm (4.04 grams) Uncertain Macedonian mint. Struck circa 180/79 B.C. Head of hero Perseus right, wearing winged Phrygian helmet. B A / Φ above and below harpa within oak wreath. Bronze 18mm (5.80 grams) Struck 357-330 B.C. Reference: Sear 1452 var. ; B.M.C. 5.8 var. Head of young Hercules left in lion’s skin. Tripod; ΦIΛIΠΠΩΝ to right, bow in case to left. Kassander - King: 319-297 B.C. Reference: SNG Copenhagen 1154-5; Cf. SNG Alpha Bank 937-41 (monograms). Head of young Hercules right, clad in lion’s skin. BAΣIΛEΩΣ KAΣΣANΔPOY, Lion walking left, broken spear in jaws; monograms below. Bronze 21mm (6.51 grams) Struck 196-168 B.C. Head of young Hercules right, in lion’s skin. ΑΜΦΑ / ΞΙΩΝ abow and below club right, within oak-wreath; monogram beneath.‘Autonomous issue in the time of the Macedonian kings Philip V and Perseus. 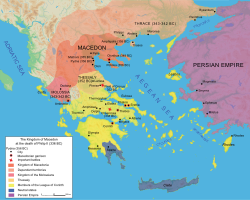 Greek – Macedonia during the Interregnum period 288-277 B.C. Macedonian shield with Gorgon’s head at center. Macedonian helmet dividing B – A ; in lower field to left, caduceus; to right, monogram. Bronze 17mm (4.52 grams) Struck circa 400 B.C. Head of Hermes right, wearing petasos. TPAIÎ›ION, Rose; crescent in field to right. Silver Denarius 17mm (3.78 grams) Rome mint, circa 127 B.C. Head of Roma right, ROMA downward behind, star below chin. M. METELLVS. Q . F around Macedonian shield with elephant’s head at center; all within laurel wreath. Bronze 25mm (11.47 grams) Struck circa 168-167 B.C. Time of Aemilius Paullus. Gaius Publilius. Quaestor, circa 168-167 B.C. MAKEΔONΩN / TAMIOY ΓAIOY / ΠΟΠΛΙΛIΟΥ in three lines, all within oak wreath. * Numismatic Note: Very rare, possibly unpublished coin from the Roman Macedonian protectorate with the name of the famous consul of the Roman Republic! Augustus - Roman Emperor: 27 B.C. – 14 A.D.
ΚΑΙΣΑΡ ΣΕΒΑΣΤΟΣ, Laureate head right. ΕΔΕΣ / ΣΑΙΩΝ in two lines within laurel-wreath; Θ above. Bronze 18mm (4.18 grams) mint of Philippi in Macedonia 14-37 A.D.
TI AVG, Bare head of Tiberius right. Foundation scene, two priests (pontiffs) plowing with two oxen right. Bronze 24mm (6.87 grams) from the Province of Macedonia 41-54 A.D.
Reference: RPC 1612; SGI 425. TI KΛAVΔIOΣ KAIΣAP, bare head left. ΣEBAΣTOΣ MAKEΔONΩN around the Macedonian shield. Bronze 25mm (5.10 grams) of Stobi in Macedonia Struck 77-78 A.D.
T CAESAR IMP DOMITIANVS CAESAR, Laureate and draped bust of Titus right vis-à-vis bare head of Domitian left. MVNICIPI STOBENSIVM, tetra-style temple on podium with two steps; inside, Dionysus standing left; clipeus in pediment. AVTO KЄCAP ΔOMITIANOC, Laureate head right. ΑΜΦΙΠΟΛΙΤΩΝ, Artemis Tauropolos standing left, holding long torch and branch, shield at her feet. KOINON MAKEDOΔΟΝΩΝ around Macedonian shield. When you buy coins, get the certificates of authenticity keep them in a standard vinyl binder in sheet protectors which you can get an any place they sell office supplies. You can also print out a receipt of the PayPal payment you sent and possibly the contact details of the seller you bought from. I have had personal experience when I purchased a coin from another dealer and since I did not keep the receipt at the time, it left a sour taste in both of our mouths when I had to return the coin, I knowing that I bought it from them and having no proof. So this would facilitate an easy return and refund as you kept a record of the item. This way you can buy from many different dealers, and also remember how much the item cost, should you want to sell it in the future, plus you have the description right there, should you want to place it on eBay or another venue. Another helpful technique is to write a little item number of the coin and write it on the little slip of paper that coin in the coin flip and having a list where you write the number where you kept it. Think also about this, a lot of collectors don‘t keep records and if they pass on and nobody in the family ever got involved with the coins, nobody knows how much they paid, so they may not got the price the original collector paid. Something worthwhile to think about. Keeping score is very important. These double pocket coin flips are available in 1 1/2, 2 × 2 and 2 1/2 inch sizes, some include paper inserts.Non-Plasticized flips are slightly more rigid than regular vinyl flips. They are considered safe for long term storage of your coins. Organize and display your coins with our felt coin display trays, designed to be used with our Aluminum coin display case (above) or as a stand alone item. Measures 16 1/8″ x 10½“Our display trays are available for storing cardboard coin holders in 1½“ x 1½“ and 2″ x 2″ sizes and for slab coin holders in either a horizontal or vertical arrangement; or a full flat tray to use any way you like! You can also do a search yourself in my store for by checking off the box that says „in titles & descriptions“ and then typing in specifically in quotes „“, the parameter like this: „reference: moneyernamehere“. This way if you are already proficient in the types and are looking for specific examples, you can find them yourself also without having to refer to this guide. Having collectibles as an investment can be a great way to diversify your investment portfolio and minimize risk. The general rule of thumb is to invest in what you love when it comes to collectibles so that if your collection doesn’t realize a return, you still get to enjoy your collection.With uncertainty ever present in the public and private markets coupled with recession and other economic ups and downs, tangible assets, also known as hard assets, present a variety of options for investors who want to put money toward areas of their personal interest. These may include income producing assets such as timberland, farmland, and commodities of all kind. For more general information on investing in tangible assets, click here. Collectibles are fast becoming a popular investment vehicle for those who have lost trust in the public stock markets or are tired of fluctuations. Tangibles allow an investment to appreciate in value over time, which appeals to investors; however, personal interest in a tangible asset remains the number one reason people choose to invest in collecting them. Rare coins are considered to be a commodity-like investment where sentimental value may exist, but coins are one tangible that can also produce attractive financial returns. Note that there is a distinction between coins as bullion and coins as numismatics. Bullion has a higher ‘melt value’ – the value the metal would be worth if melted down. Numismatic coins, because they are often much older and made of various metals and components, have a lower melt value and are worth less when melted then they are in coin form. The general rule of thumb is to buy bullion for business, numismatics for fun. This is the second in an AIMkts® series providing an introduction into various subclasses of antiques and collectibles. This installment: rare coins. People collect rare coins for the same reason people collect art, says Ilya Zlobin, ancient numismatic coin expert, dealer and enthusiast of TrustedCoins.com. “Rare coins, especially of the ancient Greeks and Romans capture the feel and the art of the time period [like] statues and architecture that have long been lost to history…” Also, says Zlobin, there is a very high upside resale potential should investors make the right buy for the right price. Once nicknamed “the hobby of kings“, collecting coins has become an everyman’s game thanks to a rise in numismatic scholarship, education, access to information and a growing sophistication of the general public over the last 500 years and is popularly referred to as “the king of hobbies”. For the average person, owning coins make possessing a piece of history remarkably accessible, and for those with an interest in antiquities, coins are more accessible, in general, than larger, tangible asset investments. Specialize – Choose a particular emperor, denomination, theme or time period and use it to guide how you invest. Stay focused on a particular concentration and build within that. Financier Louis E. Eliasberg did just that and his collection got him listed among the world’s most famed collectors. Scrutinize – Don’t just pick randomly from your choices. Know what you’re looking for and examine coins carefully to make sure they fit with the direction you’re taking your collection. Study – Collectors shouldn’t just take the opinions or advice of sellers. Collectors should become experts themselves, studying up on values, denominations, rarity and other aspects of the area in which they intent to collection so as to make an informed decision when investing. Read trade magazines, talk to other collectors and learn what questions to ask. Never buy what you don’t understand. Study up on some coin collecting lingo here. Adding to that advice, we caution all coin investors to know their dealer. Investing in rare coins is as much as investment as putting money toward any asset class – trust is key. As a purveyor of rare coins, Zlobin notes that the grading scale is subjective one, with Good (G) being the lowest, to Very Good (VG), then Fine (F) followed by Very Fine (VF), followed by Extra Fine (EF) and finally, a perfect mint-state called Fleur-De-Coin (FDC). The overall appearance of a coin and its appeal to buyers and sellers alike are all highly subjective matters and grading standards may vary. Well-known houses like Heritage Auctions provide some guidance and the Professional Coin Grading Service, among others, can give a point of reference as well, but keep in mind that very fine distinctions between coins will make a big difference in its worth, even thousands of dollars’ worth of difference for the smallest distinction. Subjectivity is considered to be one of the risks in rare coin investing. However, the Federal Trade Commission has issued warnings to help protect consumers from fraud. Read the warning here. False claims about grading, current value and buy back options are the most common ways investors lose money when collecting coins. “Examine coins in person. It’s difficult, if not impossible, to make a practical decision about buying a particular coin based on a photo or a conversation with the seller,” advises the FTC. “Check out any coin dealers in a search engine online. Read about other people’s experiences. Try to communicate offline if possible to clarify any details. In addition, contact your state Attorney General and local consumer protection agency.” And always get a second opinion. Always try to get the best possible price – Investing in rare coins doesn’t have to break your bank. Some dealers can give you breaks as the margins are often-times sufficient for everyone to be happy. Be detached about the outcome of the deal – Do your best to secure a great deal, but be an investor that can also think as a collector. This way you win either way. Keep records of how much you paid for a coin, and all receipts – This will give you a record of the coin’s grade, and purchase information. Also, if you want to sell these investments and realize a profit, you’ll need to be organized. Work with dealers willing to prove themselves – Some dealers provide a lifetime guarantee of authenticity, and some will issue certificates of authenticity. There are professional numismatic reference sites, where investors can trace the price trends of many different coin types going back many years and get an idea of how certain coins will fare on the resale market. Although any investment carries risk, and although almost all dealers of any investment will tell you that “past performance is not an indicator of future results”, investors can make informed decisions about their coins by taking a look at how the pros have traced them through the years. Is collecting rare coins for you? Coin collecting, known as “the king of hobbies” is an investment almost anyone can make. For serious investors, coins are a tangible asset that will provide diversity in an investment portfolio and help hedge against inflation as the value of rare coins is generally stable. “A lot of people don’t know this, but ancient coins are actually quite abundant,”according to Zlobin. Some celebrities and many other famous individuals are known to be avid coin collectors such as J.P. Morgan, the Hunt brothers hockey great Wayne Gretzky, Buddy Ebsen (aka “Jed Clampett”), and Nicole Kidman. The ancient Greeks and Romans used the chariot for war, racing, processions and travel. On ancient coins, the chariot was featured being driven by emperors, important personages and even gods and goddesses. They were usually pulled by horses, but on ancient coins sometimes even by flying serpents and goats. There is a certain excitement associated with the chariot that is almost archetypal. The Latin word „carrus“ is the root of the English word „chariot“. Imagine the excitement the ancient spectators would feel as they saw chariots racing around the Circus Maximus in Rome or even other parts of the empire. Chariots are a fascinating topic of study and collecting. See the sights and feel the feeling with these authentic ancient coins depicting the chariot here. Click here to see all coins with a chariot. Biga, Triga and Quadriga chariots on ancient ancient Roman coins. Biga means a two horse, triga means a three horse and a quadriga means four horse chariot. A chariot pulled by goats! By winged serpents, with this depiction of Triptolemus. By even elephants! There is even a story about Pompey the Great who tried to use a chariot pulled by elephants for his triumphal march through Rome. It couldn‘t fit through the gates though, so he had to get on a regular chariot pulled by horses. There was a Greek general who had a battle on the streets of one of the Greek cities he tried to conquer. One of his commanders tried sending an elephant through the doorway into the city. However, the elephant got stuck and the re-enforcements could not come for the battle. Also it was Seleukos I of the Seleukid kingdom, who traded the territories Alexander the Great won in northern India for 500 War elephants. Hannibal also apparently used the war elephants. Alexander the Great battled elephants in India mounted by archers. Interesting and exciting creatures elephants are! Interesting type issued for Constantine, for his deification, where he is pictured taking a quadriga (four horse) chariot up to heaven with the hand of God accepting him.